(Nanowerk News) To make "clean" fossil fuel burning a reality, researchers have to pull carbon dioxide out of the exhaust gases that rise from coal or natural gas power plants and store or reuse it. For the capturing feat, researchers are studying special scrubbing liquids that bind and release the gas, but some of the most promising ones thicken up to a cold honey consistency when binding carbon dioxide, rendering them inefficient and expensive to use. Now, researchers have used computer modeling to design these liquid materials so that they retain a low viscosity after sponging up carbon dioxide, based on a surprise they found in their explorations. Although the chemists still have to test the predicted liquid in the lab, being able to predict viscosity will help researchers find and design cheaper, more efficient carbon capture materials, they report in Journal of Physical Chemistry Letters ("Dynamic Acid/Base Equilibrium in Single Component Switchable Ionic Liquids and Consequences on Viscosity"). A normally freely fluid liquid (yellow) turns into a liquid the thickness of cold honey after it binds carbon dioxide (red). Modifying its chemical structure frees it up into a noncharged, thin liquid again (blue). "We're hoping to drive down the operational costs," said chemist Roger Rousseau of the Department of Energy's Pacific Northwest National Laboratory. "With a lower viscosity, we can run the process at lower, optimal temperatures, and the cost to implement drops astronomically." Coal and natural gas power plants currently emit substantial quantities of global greenhouse gases, but carbon capture and storage technologies provide one promising potential path to reduce those emissions. To separate the gas, researchers are designing materials that can reversibly — and only — bind carbon dioxide. Exhaust fumes are mixed with the material in some way, the material collects the greenhouse gas like a sponge, and then other processes would, figuratively, squeeze the sponge to get the carbon dioxide back out — for storage out of the atmosphere or reuse in fuels or chemicals production. A frontrunner for such materials are liquids known as carbon dioxide binding organic liquids, or CO2BOLs for short (pronounced co-balls). CO2BOLs have an advantage over many technologies — they are not water-based. Water-based materials that collect carbon dioxide require a lot more energy to pull the carbon dioxide back out, because the process involves heating. Researchers have studied CO2BOLs for many years, but had trouble overcoming a thickening problem. The CO2BOLs by themselves are similar in viscosity to water, but once they bind carbon dioxide, they become thick like cold honey. The more carbon dioxide they collect, the thicker they get. The high viscosity is a drawback in many respects: Pumping thick liquids through pipes to a facility to collect the carbon dioxide requires a lot of energy and pulling the gas out of the liquid requires a lot of heat. Also, operators cannot collect as much carbon dioxide as the CO2BOL will hold; they have to keep the viscosity thin enough to pump the fluid. Economic calculations suggest using CO2BOLs inefficiently like this would be expensive. "The high viscosity would significantly increase the cost compared to conventional carbon capture technology," said PNNL chemist Dave Heldebrant, a coauthor on the study who is leading the chemical synthesis part of the team. Not willing to give up on a promising technology, Rousseau and his colleague Vassiliki-Alexandra "Vanda" Glezakou took to the computer. They decided to see if they could predict the viscosity of a molecule with molecular simulations. That would allow them to design low-viscosity CO2BOLs that could then be tested in the lab. They started by seeing what was going on with a simple CO2BOL and carbon dioxide. They chose a molecule called IPADM and simulated its binding with carbon dioxide. In doing so, the computer program must keep track of the position and movement of many thousands of atoms in the simulation. They found that a neutral carbon dioxide molecule landed on a particular place on the neutral IPADM, forming IPADM-CO2. When this happened, the electrons shuffled around between atoms. This created a spot within the IPADM-CO2 with a positive charge and another spot with a negative charge. The result is an overall neutral molecule that has separated positive and negative charges, what chemists call a zwitterion. Glezakou, Rousseau and colleagues performed multiple simulations, but mixed (computationally) an increasing percentage of carbon dioxide into the IPADM molecules. They saw a relation between how the charges moved around on the molecules and their viscosity. This allowed them to develop an equation that could calculate viscosity from various chemical characteristics of their CO2BOLs. They validated their equation by comparing calculated viscosities of different CO2BOLs with known values. Their analysis also showed them that the zwitterion is what ramps up the viscosity. The internal positive and negative charges can interact with such charges on other IPADM-CO2 molecules, preventing them from freely moving around. Without the -CO2, the IPADM is thin as water. With it, honey. Could the researchers get rid of those charges? In other zwitterions, the researchers knew that protons often moved around, sometimes forming a neutral molecule. They wondered if they could force CO2BOLs to do this as well by changing the molecular scaffold to push back the proton to the negative part of the molecule once it captured carbon dioxide, resulting in a neutral acid. "The minute we saw that the acid form was more stable for some CO2BOLs, we knew instantly that we could change the molecular structure of candidate CO2BOLs to make that happen more often," said Glezakou. "Nobody was considering the neutral acid form for these systems before. The conventional idea was that CO2BOLs would always be an ionic liquid, but clearly it doesn't have to be. But the trick is to have the two parts of the molecule that receive the proton in close proximity and able to share the proton." If this idea panned out, viscosity would no longer be an issue for a non-ionic carbon capture solvent systems. They team simulated IPADM binding to carbon dioxide again, but they included two variations on IPADM. The two variations included small chemical changes to IPADM that would influence where electrons traveled through the bound structure. They simulated 25 percent of the CO2BOLs binding carbon dioxide and determined how easily the neutral acids formed. The team saw that, unlike IPADM, the other two CO2BOLs unexpectedly formed the neutral acid easily, almost as easily as it formed the zwitterion. One called EODM, especially, was about 50 percent zwitterion and 50 percent neutral acid. The scientists then determined what form IPADM-CO2 took in real life. 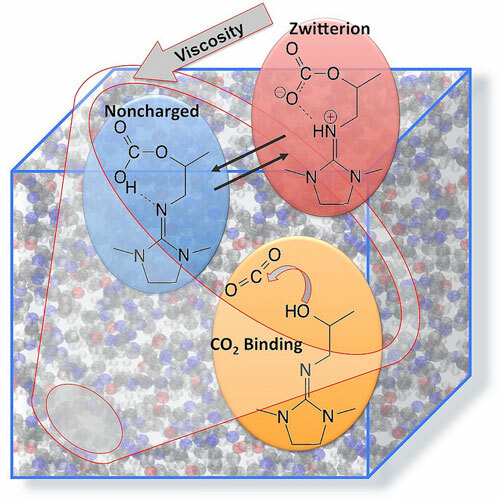 Comparing the values of calculated viscosities with experimentally determined viscosities, the chemists concluded that IPADM-CO2 most commonly forms the zwitterion. But what would happen to IPADM-CO2's viscosity if the neutral acid formed? The chemists calculated the predicted viscosity of IPADM-CO2 and its two variations. For all three, the predicted viscosity dropped by more than half. Armed with what they now know has to happen to their CO2BOLs, the chemists are shifting their focus towards molecules that keep the charged parts near each other and that are more likely to form the neutral acid variation. Some initial measurements in the lab confirmed the findings, with more to come. "If we could cut the viscosity by 50 percent or more, CO2BOLs would be acting in their optimal range and be far more efficient," said Heldebrant. "This is a fine example of how fundamental science and molecular level insights can accelerate technology in real time", said Glezakou. "And this was possible through the unique integration of cutting-edge theory and experiment."